In the year 1976 the captain and the vice-captain of S. Thomas’ first eleven cricket team were Ganeshan brothers and they won 8 out of the 12 matches they played. This was an year where they had Sidath Wettimunny and Thilan Wijesinghe playing for Ananda, Ranjan Madugalle for Royal, Anura Ranasinghe for Nalanda, Tisseras for Trinity, and as a result their 8 wins were all the more creditable. This incredible team was led by Shashi Ganeshan a humble Thomian who greeted me with open arms when I went all the way to Beach Road Mount Lavinia for this interview. His brother Agit Ganeshan was his able assistant, in that record breaking team that set up two records. It was the only occasion that two brothers became the captain and the vice-captain in a Thomian Team, which was one and the next was if my memory serves me right they beat a strong Ananda Team and that win was there in the record books till this year when the Thoras beat Ananda again. Another feather in his cap was that Shashi became the head prefect of the school. Shashi’s father was a Peterite who later became the Chief Government Analyst. I gathered during the course of the interview that Shashi was a “died in the wool true” blue Thomian who climbed the ladder from the bottom rung after entering Thomian Prep.He went through junior cricket with ease and opened batting right through out. Shashi had a slight hic-up in his batting which was sorted out by that Grand Old Thomian Geoff Wijesinghe, in spite of being a top rung reporter Geoff was also highly involved with Thomian cricket stated Shashi. Lassie Abeywardene then was the full time coach. Shashi pointed out that there were a lot of camaraderie between the school boy cricketers then, be it the Thomians,Royalists, Anandians, Peterites, Nalandians, Wesleyites, Anthonians etc. He stated that they had more time to watch matches even between their contemporaries and to mingle with them and he was quick to point out that they also spoke fluent English. It is a different storey now lamented Shashi he stated that the Quality time that was available was stolen by tuition classes sprouting all over the place which unfortunately have become the in thing now. Shasi was spot on when he said that the Thomians in his era were amiable to all and sundry. Shashi’s team of 1976 had Guy De Alwis, Saliya Ahangama and Ishak Shahabdeen who went on to play for Sri Lanka. According to him even then Saliya Ahangama could swing the ball both ways and gave his 200% to the team and Guy De Alwis who was a hard hitting batsman and an excellent wicketkeeper unfortunately succumbed to the silent killer later on. He also reminisced about Lalith Ratnayake who is no more due to unfortunate circumstances. He did not extend his school cricket career and opted to join Aitken Spence as a Junior Executive at Singapore Airlines and with sheer hard work, integrity and dedication he rose to the top.Shashi mentioned that his experience at Singapore Airlines was tough in the sense that they were on the ball 24/7 and he was up to it and relished that experience. 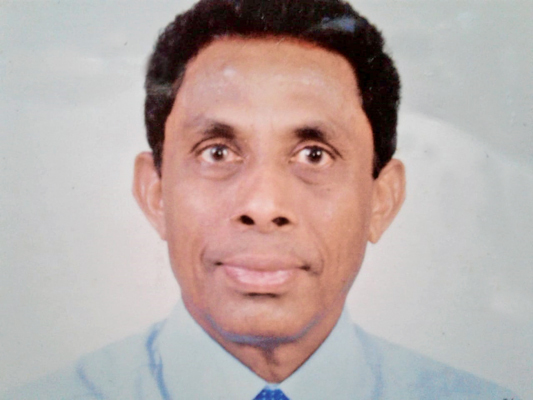 Shahi was there for 40 years, during his tenure at Aitken Spence he had a brain haemorrhage and due to timely action he survived.He was 38 years at the time and he recovered quickly due to his young age. Even now his view from the left eye is partly affected and he cannot take part in any sport. Shashi had a horrendous experience in 1983 when he stayed at Wellawatte, all his trophies and paper cuttings were burnt to cinders and the house razed to the ground.He and his family were lucky to survive due to friendly neighbours. According to Shashi the best Thomian batsman was Anura Tennekoon and the best bowler Barney Reid. Referring to the latest incident where Dimuth Karunaratne under the influence of liquor unfortunately lost control and had a mishap with a three wheel driver, Shashi’s views was that as a captain of the Sri Lanka team being drunk was a disgrace.Shashi mentioned that Kumar, Mahela and Vaas knew how to behave and they were role models. Shashi is taking a well earned rest now and he has time to read a lot of sports books and to potter around the garden. As we all know the World Cup is round the corner every cricket lover is wondering about the squad and the captain? We fervently hope that Asantha De Mel and co will come up with the right combination and select a captain who could last the course. We have bowling allrounders a plenty and Tisara Perera, Isuru Udana and even Dhananjaya De Silva comes to mind. In my opinion Dimuth Karunaratne may not be considered due to that drunken driving offence and causing injuries to an innocent tuk tuk driver. That leaves Lasith Malinga and Dinesh Chandimal in the reckoning, since of late Chandimal has been side stepped for reasons best known to the higher up and probably for him to get into the swing of things so to say will be a tough ask and that leaves Lasith Malinga and he looks hell bent on restoring his reputation as top class ODI bowler and my bet is Malinga as the captain and Dinesh Chandimal should be included in the team and also bouquets to the SLC guys including Shammi Silva for slapping a hefty fine on Karunaratne and hope it will extend to guys like Danushka Gunathilake and the like so that the SLC could keep a clean sheet.